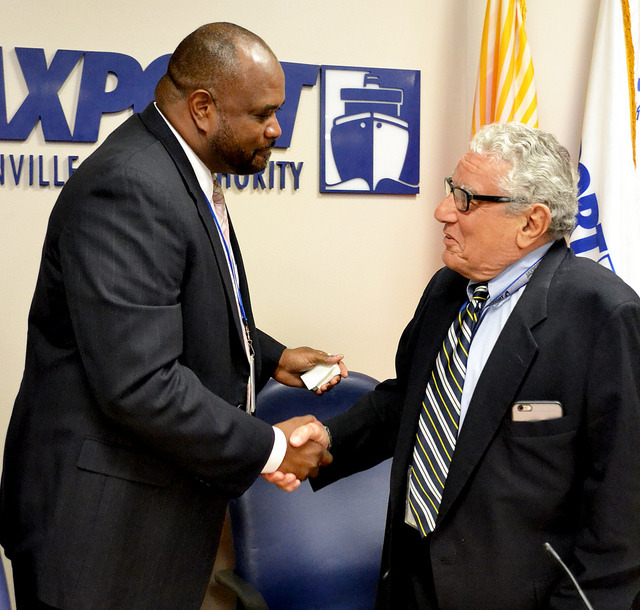 New Jaxport CEO gets a congratulatory handshake from Board Chairman John Citrano. 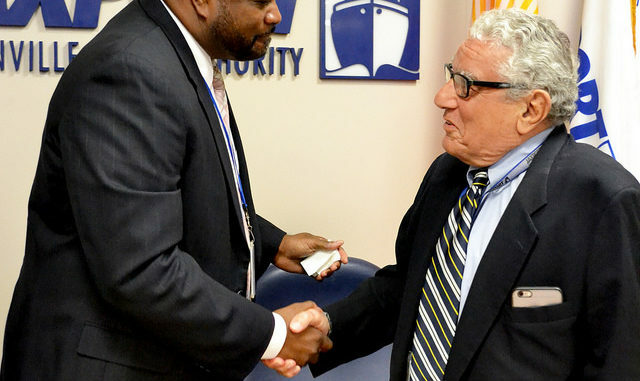 The Jacksonville Port Authority Board of Directors has unanimously voted to hire longtime JAXPORT executive Eric Green as Chief Executive Officer. The JAXPORT Board conducted a national executive search to fill the vacant CEO position, culminating in the selection. Green, appointed JAXPORT interim CEO in March, joined the port in 2005 and served previously as Senior Director, Government and External Affairs, leading the successful effort to gain authorization and funding to start the Jacksonville Harbor Deepening project. The project to take the federal shipping channel to 47 feet will begin construction in the next few months. Prior to joining JAXPORT, Green served in numerous leadership roles for the City of Jacksonville, including Deputy Chief Administrative Officer. In this position, Green managed several city departments and was instrumental in the successful development, passage and implementation of the $2 billion Better Jacksonville Plan. 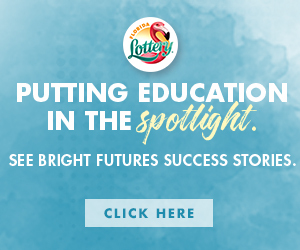 A Jacksonville native, Green is a member of the Board of Directors of the JAX Chamber and the Florida Chamber of Commerce and is an alumnus of both Leadership Jacksonville and Leadership Florida. He is active with youth activities at Bethel Baptist Instituitional Church. Green is a graduate of Saint Andrews Presbyterian College and holds a Bachelor of Arts degree in Political Science.